Do you ever seize to be amazed? 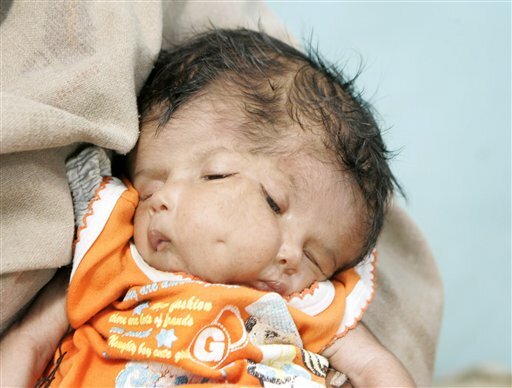 In India a baby girl, Lali, was born with two faces, a very rare condition knowns as craniofacial duplication. When I saw this photo I thought, “Oh no! Poor child. Poor family. How will they ever survive this enormous trail?” But then I read the article in the Chicago Tribune. I was simply awestruck. Instead of feeling “cursed” by God (or the gods), this family actually feels blessed, even believing the child to be the reincarnation of a Hindu goddess. They plan to build a temple in her honor, and people are visiting them every day bringing gifts and money. Their poor little village is now known all across the world. The other blessing is that the girl actually is doing well physically. Her parents say Lali is fine, just like any other child. Naturally, life will be become more and more difficult for the girl as she grows up, but I am still impressed how this family has taken on this seemingly impossible challenge and turned it around; they only see their child as a blessing for the family, nothing else. Talk about a positive outlook. I hope the grace of God will continue to wrap its arms around little Lali – especially in the years ahead. Practically, this little baby will have to face many challenge with here two face. may god bless her. Wow, this is really interesting! When I saw this picture I thought of a million questions. Is this really one child with two faces or is it actually two children combined? Do they share the same brain? Do both mouths feed? Cry? Spit up? Does one “face” control one half of the body and the other control the other? well its actually a miracle that the child’s parents did not bury her alive as that is what most indian parents will do.religion wise or not i am happ that this child is still alive.though lil lali might struggle in future but she has all the blessings from everyone around her so im sure she will be fine.as a hindu myself im grateful that at least this child is alive eventhough people might think she is a reincarnation of godess. So as a former “fan” I read some of your postings. I saw the two-faced Lali and my first thought was about how her brain will command her 4 eyes, 2 mouths, etc. Well I kinda got that answer too (thank you for listing her disorder). Well it’s time to put my shock to sleep. For your own sake I hope you will try to live healthier. Give my best to your parents. I had a small yet noticable physical problem when I was a child. The attitude my parents had about it went a long way to help me deal with it and accept it. Others may tease me or reject me and that I would be ok because they just didn’t understand. Bless her parents for such a wonderful attitude no matter where it comes from. Just think, twice the smile, twice the sparkle in her eyes and the adorable extra dimple. she truly is a blessing, to all those arround her as she grows and teaches those arround her. A baby with two faces – now how amazing is that! But my next thought is, what religion means to people! That is sometimes equally amazing. My thoughts are somewhat like yours; Oh my God this must be a disaster for this family. But they don’t think so. They instantly found some religious meaning in what happened to them. Some would say they are plain stupid (…) Don’t get me wrong, I believe in miracles, I do. Still I can’t help wondering, what kind of situation would it take to make us christians come to a similar conclusion? To me, not believing in the Hindu gods or goddesses, it’s hard to understand how they can see what happened as a blessing. And they refuse to have the baby properly checked by health care personnel. Is it stupidity – or true faith?